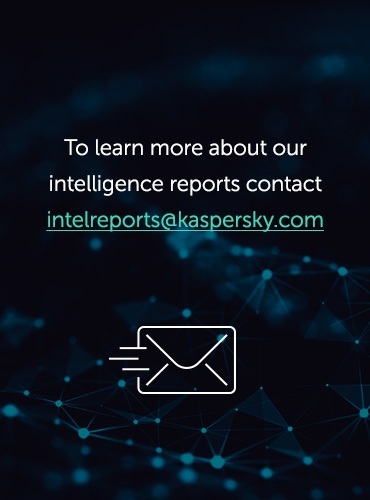 In October 2012, Kaspersky Lab’s Global Research & Analysis Team initiated a new threat research after a series of attacks against computer networks of various international diplomatic service agencies. 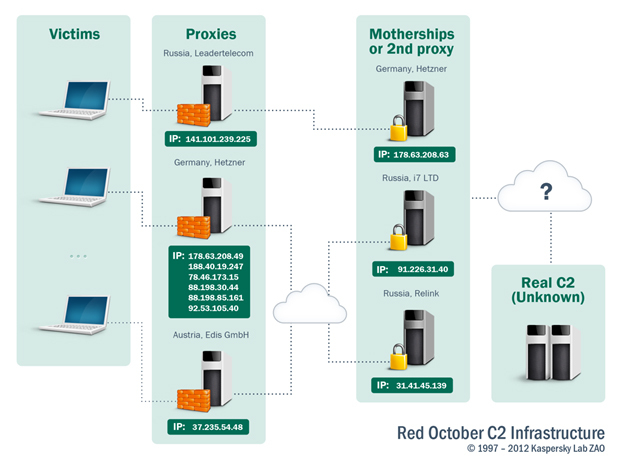 A large scale cyber-espionage network was revealed and analyzed during the investigation, which we called “Red October” (after famous novel “The Hunt For The Red October”). The earliest evidence indicates that the cyber-espionage campaign was active since 2007 and is still active at the time of writing (January 2013). 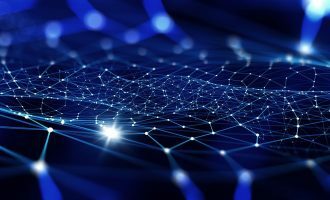 Besides that, registration data used for the purchase of several Command & Control (C&C) servers and unique malware filenames related to the current attackers hints at even earlier time of activity dating back to May 2007. The malicious code was delivered via e-mail as attachments (Microsoft Excel, Word and, probably PDF documents) which were rigged with exploit code for known security vulnerabilities in the mentioned applications. In addition to Office documents (CVE-2009-3129, CVE-2010-3333, CVE-2012-0158), it appears that the attackers also infiltrated victim network(s) via Java exploitation (known as the ‘Rhino’ exploit (CVE-2011-3544). Right after the victim opened the malicious document or visit malicious URL on a vulnerable system, the embedded malicious code initiated the setup of the main component which in turn handled further communication with the C&C servers. The main purpose of the spying modules is to steal information. This includes files from different cryptographic systems, such as “Acid Cryptofiler”, (see https://fr.wikipedia.org/wiki/Acid_Cryptofiler) which is known to be used in organizations of European Union/European Parliament/European Commission since the summer of 2011. All gathered information is packed, encrypted and only then transferred to the C&C server. The embedded executable is a file-dropper, which extracts and runs three additional files. Another noteworthy fact is in the first line of this file, which is a command to switch the codepage of an infected system to 1251. This is required to address files and directories that contain Cyrillic characters in their names. The “LHAFD.GCP” file is encrypted with RC4 and compressed with the “Zlib” library. This file is essentially a backdoor, which is decoded by the loader module (svchost.exe). 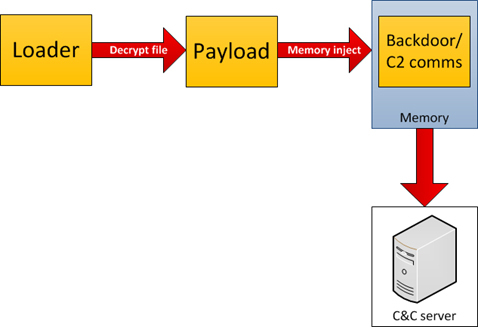 The decrypted file is injected into system memory and is responsible for communication with the C&C server. The connections with the C&C are encrypted – different encryption algorithms are used to send and receive data. 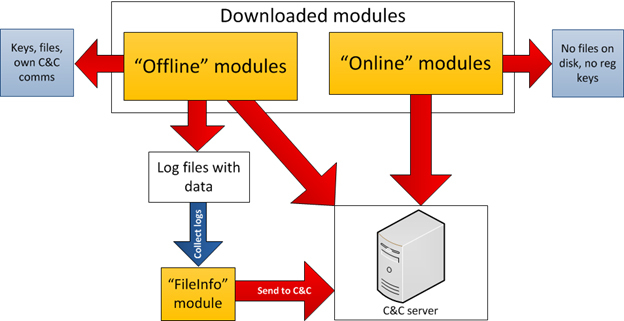 After a connection with the C&C server is established, the backdoor starts the communication process, which leads to the loading of additional modules. These modules can be split into two categories: “offline” and “online”. “Offline”: exists as files on local disk, capable of creating its own system registry keys, local disk log files, and may communicate with C&C servers on their own. 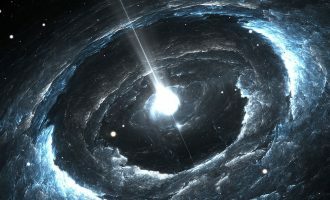 “Online”: exists only in system memory and is never saved to local disk, do not create registry keys, all logs are also kept in memory instead of local disk and sends the result of work to the C&C server using own code. There is a notable module among all others, which is essentially created to be embedded into Adobe Reader and Microsoft Office applications. The main purpose of its code is to create a foolproof way to regain access to the target system. The module expects a specially crafted document with attached executable code and special tags. The document may be sent to the victim via e-mail. It will not have an exploit code and will safely pass all security checks. However, like with exploit case, the document will be instantly processed by the module and the module will start a malicious application attached to the document. This trick can be used to regain access to the infected machines in case of unexpected C&C servers shutdown/takeover. We have identified over 1000 different malicious files related to over 30 modules of this Trojan kit. Most of them were created between May 2010 and October 2012. We used two approaches to identify targets for these attacks. First, we used the Kaspersky Security Network (KSN) and then we set up our own sinkhole server. The data received using two independent ways was correlating and this confirmed objective findings. 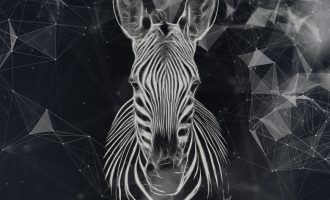 The attackers used already detected exploit codes and because of this, in the beginning of the research we already had some statistics of detections with our anti-malware software. We searched for similar detections for the period of 2011-2012. That is how we discovered more than 300 unique systems, which had detected at least one module of this Trojan kit. 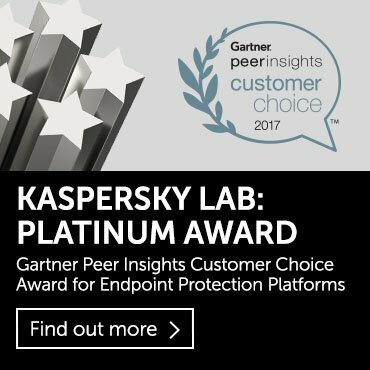 Once again, this is based on data from Kaspersky AV products. Apparently, real number and list of victim names is much larger than mentioned above. During our analysis, we uncovered more than 60 different domains used by different variants of the malware. Out of the list of domains, several were expired so we registered them to evaluate the number of victims connecting to them. All the sinkholed domains currently point to “95.211.172.143”, which is Kasperskys’ sinkhole server. 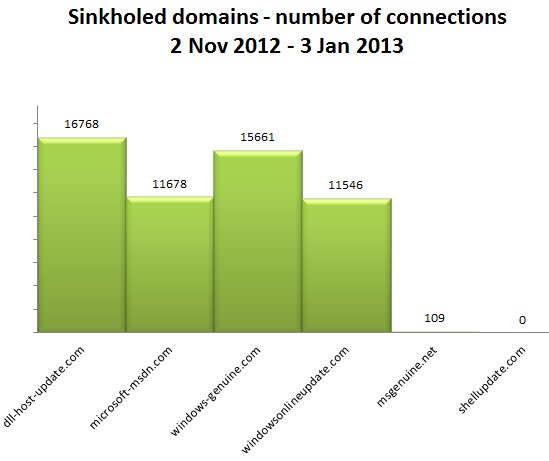 During the monitoring period (2- Nov 2012 – 10 Jan 2013), we registered over 55,000 connections to the sinkhole. The most popular domain is “dll-host-update.com”, which is receiving most of the traffic. From the point of view of country distribution of connections to the sinkhole, we have observed victims in 39 countries, with most of IPs being from Switzerland. Kazakhstan and Greece follow next. Interestingly, when connecting to the sinkhole, the backdoors submit their unique victim ID, which allows us to separate the multiple IPs per victims. 947827A169348FB01E2F Bosnia and Herzegovina ? 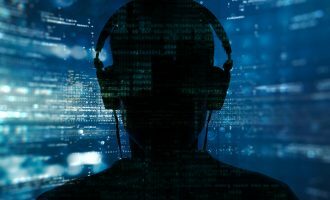 In some cases, it is possible to create a profile of the victim based on the IP address; in most of the cases, however, the identity of the victim remains unknown. Some of the victim organizations were identified using IP addresses and public WHOIS information or remote system names. 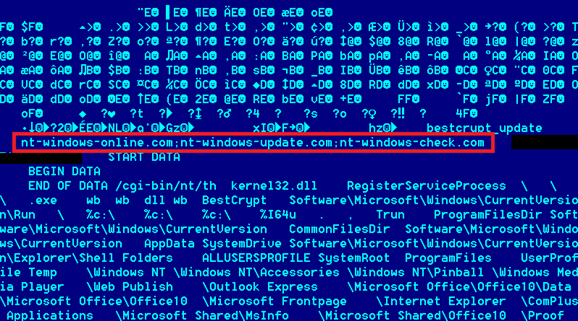 Interestingly, although the domain “dll-host-update.com” appears in one of the malware configurations, it had not been registered by the attackers. 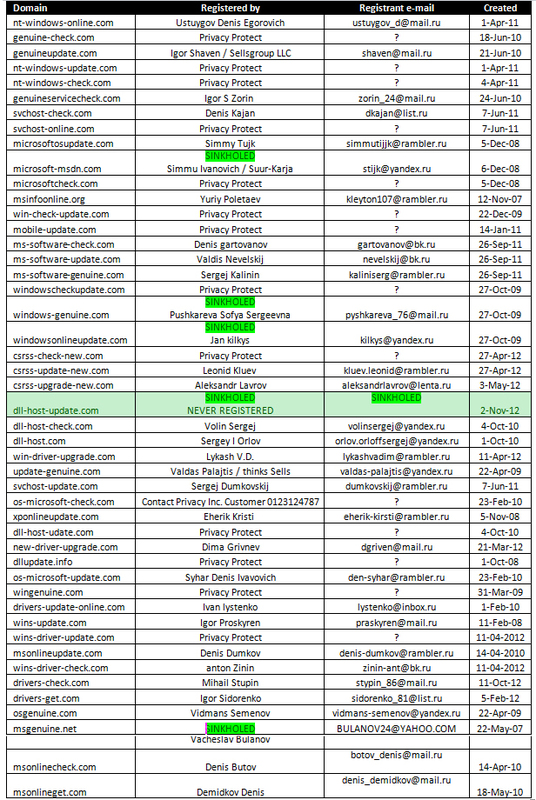 The domain has since been registered by Kaspersky Lab on Nov 2nd, 2012 to monitor the attacker’s activities. Another interesting example is “dll-host-udate.com” – the “udate” part appears to be a typo. 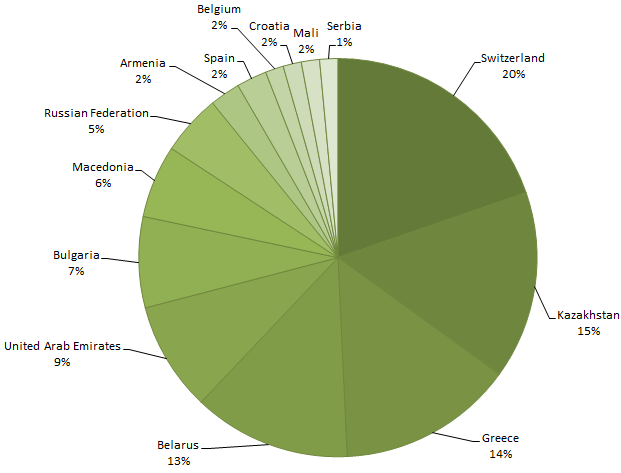 All the domains used by attackers appear to have been registered between 2007-2012. The oldest known domain was registered in Nov 2007; the newest on May 2012. Most of the domains have been registered using the service “reg.ru”, but other services such as “webdrive.ru”, “webnames.ru” or “timeweb.ru” have been used as well. During our monitoring, we observed the domains pointing to several malicious webservers. A list of servers with confirmed malicious behavior can be found below. In total, we have identified 10 different servers which exhibited confirmed malicious behavior. Most of these severs are located in Germany, at Hetzner Online Ag. During our analysis, we were able to obtain an image of one of the command-and-control servers. The server itself proved to be a proxy, which was forwarding the request to another server on port 40080. The script responsible for redirections was found in /root/scp.pl and relies on the “socat” tool for stream redirection. It should be noted that the “last modified” field of the pages points to the same date: Tue, 21 Feb 2012 09:00:41 GMT. This is important and probably indicates that the three known mini-motherships are probably just proxies themselves, pointing to the same top level “mothership” server. For instance, the script “/cgi-bin/nt/th” is being used to receive commands from the command-and-control server, usually in the form of new plugins to run on the victim’s computer. The “/cgi-bin/nt/sk” script is called by the running plugins to upload stolen data and information about the victim. When connecting to the C&C, the backdoor identifies itself with a specific string which includes a hexadecimal value that appears to be the victim’s unique ID. Different variants of the backdoor contain different victim IDs. Presumably, this allows the attackers to distinguish between the multitudes of connections and perform specific operations for each victim individually. For instance, a top level XLS dropper presumably used against a Polish target, named “Katyn_-_opinia_Rosjan.xls” contains the hardcoded victim ID “F50D0B17F870EB38026F”. A similar XLS named “tactlist_05-05-2011_.8634.xls / EEAS New contact list (05-05-2011).xls” possibly used in Moldova contains a victim ID “FCF5E48A0AE558F4B859”. Part 2 of this paper will cover malware modules and provide more technical details about their operation.